Does the rush of the holiday season leave you feeling as if you might be missing something? With so many things to do and places to go, it is important not to overlook elderly family members. For many, the holidays are filled with celebrations and festivities with family and friends, but it can be a difficult time for those who have difficulty getting around, or are confined to their homes. Many seniors report feelings of loneliness and isolation, and these feelings can be exaggerated during the holidays. Seniors might choose to forego family celebrations and festivities for fear of falling or being a burden. Unfortunately a day out with an elderly person cannot be spontaneous. However, with a little pre-planning and modifications, holiday traditions and activities can be made easier and safer for senior family members. Contemplate ways to include older relatives who may have difficulty getting around. How far can the elderly person travel? Are the costs affordable to the senior? How much walking is involved? Are there hills or other obstacles that would make it hard to navigate? Are there benches or chairs that can be used? Make sure you have all the medications needed. Take an extended supply, just in case you are still out when the next dose is due. Have clothing appropriate for the weather and the outing. Comfortable shoes and warm weather clothes are important. Bring along extra clothes in the case of an accident. Bring some snacks and plenty of water. You may be perfectly capable of navigating the string of Christmas lights sprawled across the living room floor, but an elderly person may trip over them and experience a severe fall. Be aware of how decorations may affect your loved ones ability to move freely throughout the home without increasing the risk of falls. Just because you can easily navigate the extra decorations, doesn’t mean that your loved one will. Look for extension cords or floor rugs that can lead to a fall. Consider the effect that too much clutter can have on a loved one with dementia or Alzheimer’s. Too many lights, music and decorations can prove to be too overwhelming. Make sure that walkways are clear of ice and snow. The holidays give seniors something to look forward to, provide a stimulating change of scene, and create pleasant memories to carry with them. 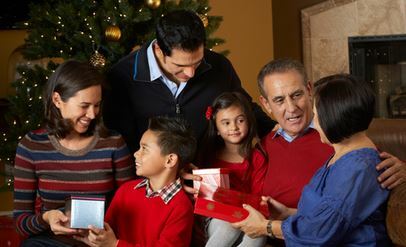 So, even though it may take a little extra planning and work, involving your senior family members in holiday celebrations can improve the meaning of the holiday season.